For nearly a decade now, I have been working with Dragon NaturallySpeaking and helping people with disabilities use DNS to control their computer and get work done. In past when I had a new DNS user, I had to meet with them for a 2 to 4 hour initial training, and meet with them about an hour a week for a month or two to get them set up and effectively using Dragon. Of course some people require more support, and some a lot less. In the past year, I have seen my referrals nearly double, and I don't have nearly enough time to provide the support DNS users need, especially when they have never used a computer before. I started looking for a computer based training solution, and I discovered Voice Power. Voice Power is able to provide effective training, and I have discovered it can do so much more. Voice Power is a software tool that runs along side Dragon NaturallySpeaking that provides training, help, and macro commands to enhance voice control over the computer system. Every time I use this program, I discover some other feature or set of commands I didn't know it had. I see it as having two modes of operation. First, you can run it with Dragon and just use it for the macro commands, running in a minimized state. Or, you can run it and use the lessons, help files, demonstrations, and reference materials next to what ever other programs you are using. Dragon NaturallySpeaking, Internet Explorer, Gmail, Outlook, Word, Explorer, Excel, PowerPoint, QuickBooks 2006, Yahoo! e-mail, Windows, and WordPerfect. The voice power window that shows the lesson runs next to the program you are using, so that you can reference the list of commands while you are using the program. I have been working with one person who is learning to use DNS with PowerPoint, and voice power has been very helpful for us. 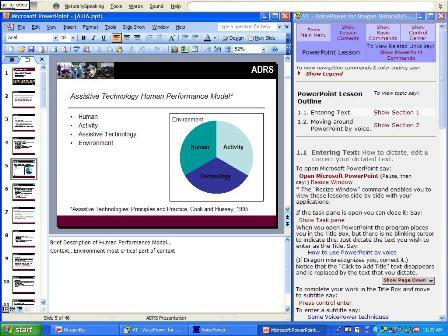 The picture shows a screenshot of Voice Power running on my computer with PowerPoint, with the PowerPoint Lesson open. There is a version of Voice Power for DNS Preferred and a version for DNS Pro. Both programs are under $200, which is reasonable for additional functionality and training it provides to computer users. One last note, when I loaded it on my laptop, which has a mobile Pentium 4 processor with 512 megs shared ram, already running XP Pro and DNS Pro v9, I had a bit of a problem with response time. I ended up maxing out my RAM to 1GB. At first it was still slow, but it eventually started working at a reasonable rate. The first client I got if for had a similar laptop but a different brand, and Voice Power ran perfectly fine on his system from the start. I suspect that this program running with DNS Pro and other memory hogging apps should really be running on a dual core system with more than a gig of ram. As always, it is important to have a robust computer system to run these applications at a reasonable speed. All in all, I am impressed with this software, and I have started recommending it for some my clients. I look forward to seeing the future upgrades and enhancements for Voice Power.